More specifically, the John H. Johnson President’s Award, given annually to the minors’ most well-rounded franchise. "I almost didn’t believe it at first," TinCaps president Mike Nutter said. "We have been trying to get it each year. We won’t take it for granted." Fort Wayne was voted as the nominee for the low-A Midwest League, and each league, from rookie ball up to the Single-A, Double-A and Triple-A levels, has a nominee. That’s a pool of 160 clubs at the beginning of the process. "This award has reflected the TinCaps’ contribution to baseball," Mayor Tom Henry said Thursday during the announcement at Parkview Field. "But what really gets me is their contribution to the city of Fort Wayne. I’m not sure if our citizens really realize what this stadium has done to the city. It really has served as the catalyst for so much growth." Criteria for the award are franchise stability and making "significant" contributions to the community, league and the overall baseball industry. 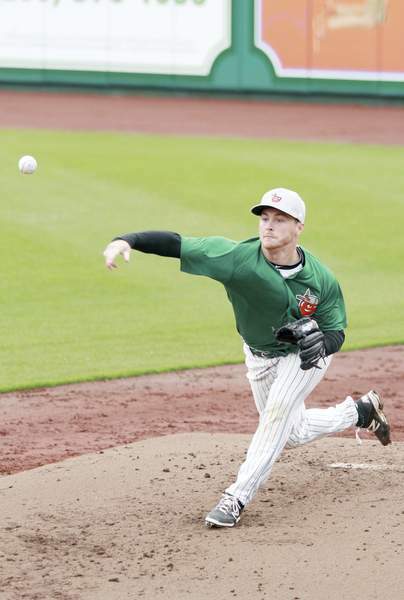 Ironically, the TinCaps had a rare down year on the field in 2016, a 62-78 record snapping their streak of seven straight playoff appear­ances, which had been the minors’ longest. But Nutter felt the club was operating at a high level in all other respects, which put it in position for the top honor. "I’d be lying to say no," Nutter said, "because we look at (Triple-A) Indianapolis right down the road, which was their 20th year and just had their best attendance ever. Some people open a stadium and the attendance dives, and Year 8 was our best, so we’ve not been a part of that trend." The TinCaps drew a total attendance of 413,701 this year, Parkview Field’s best mark since opening in 2009. Fort Wayne’s attendance exceeded 12 of 30 Triple-A teams, 28 of 30 in Double-A. "Maybe other people are now looking at us wondering if they can be like us," Nutter said. "And that’s flattering." The Johnson Award is one of five Minor League Baseball Post-Season Awards. Formal presentation will take place on Dec. 4 at baseball’s winter meetings in National Harbor, Maryland, and the TinCaps plan to display the trophy at a prominent place in their park. During Thursday’s news conference, a pre-recorded video message was played from Minor League Baseball president Pat O’Conner. "I’d like to congratulate the TinCaps," he said. "The Johnson Award is emblematic of the complete franchise, and the TinCaps were the perfect example of what minor league baseball is all about." The TinCaps won one of the five Post-Season Awards last season, the John H. Moss Community Service Award. The Johnson Award, since its inception in 1974, has been a way to honor the late head of the National Association that grew into the current structure. "We’d been nominated two or three times (previously)," Nutter said. "It didn’t ever go our way. When you get that call from Pat O’Conner it’s pretty cool. I was emotional."